Let’s face it – at first thought, burgers are boring, and if you’ve done one burger, you’ve done them all. 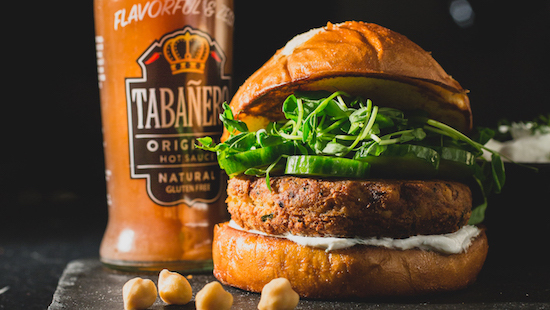 To flip the script, FOODBEAST and Tabañero Hot Sauce decided to create this legendary falafel burger, because if you’re making a cookbook, there’s always room for a burger recipe. Falafel is a well-known Middle Eastern dish made of spiced, mashed chickpeas, which is traditionally rolled into a round ball and deep-fried. However, For this Tabañero X FOODBEAST recipe, you’ll add the chickpeas to a food processor to create a falafel burger patty, rather than forming them into round balls. To bring out even more of a Mediterranean flare, this burger is topped with sliced cucumbers, alfalfa sprouts, and a dill yogurt spread served on a bun of your choice. It also doesn't hurt we have our most intimate Tabasutra position yet – The Love Tab. The sultry notes of Tabañero hot sauce and meaty chickpeas are guaranteed to change the way you look at this dish forever. Soak dry chickpeas overnight in bowl covered by 3-4 inches of water. Drain the next day until completely dry – the volume should have expanded. Combine all ingredients for patty into a food processor and pulse until a coarse paste forms. Season with salt and pepper and refrigerate until chilled. Form patty to size from chilled paste. In a sauté pan, heat grapeseed oil to 350 degrees. Dust patties with more flour as needed and shallow fry until golden brown and fully cooked in the middle. Drain on paper towel and season with salt immediately. Toast Burger buns, spread Dill yogurt on buns, place falafel patty on bun, and build the burger with sliced cucumbers and alfalfa sprouts.